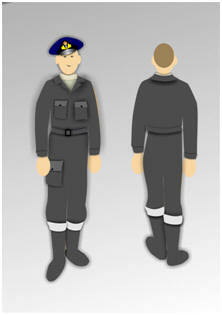 Working uniform with red rank badges and insignia. 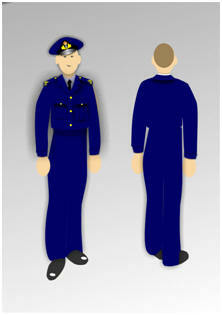 Dress suit uniform with gold badges and insignia. 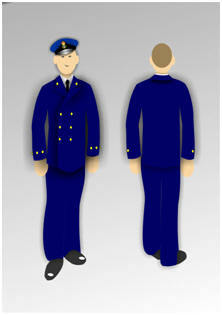 Summer/warm climate uniform with blue badges and insignia. 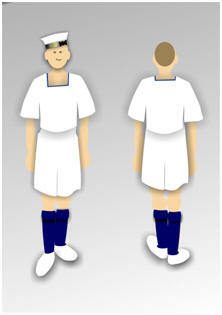 White cap would be worn in summer or in warm climates. Blue cap would be worn in winter. 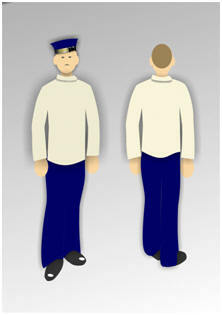 The badges denote a Leading Seaman (anchor) with three good conduct stripes, an aircraft fitter (four blade propeller), airframe (denoted by the "A" under the propeller). The star above the propeller denotes a Leading Rating (Chief Petty Officer, Petty Officer or Leading Seaman). The badges denote a Petty Officer (crossed anchors) with one good conduct stripes, a gunner (cannon). The star above the cannon denotes a Chief Petty Officer or Petty Officer. The badges denote a Leading Seaman (anchor), an air mechanic (two blade propeller), airframe (denoted by the "A" under the propeller). The star above the propeller denotes a Leading Rating (Chief Petty Officer, Petty Officer or Leading Seaman). The collar has three white tapes (stripes). Don't attempt to paint three white lines - in our view it's more effective and looks more in scale just to paint one white stripe. 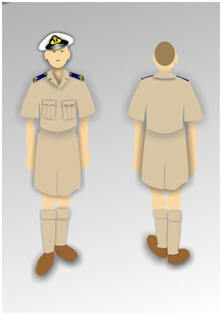 Rank insignia worn on the sleeve. 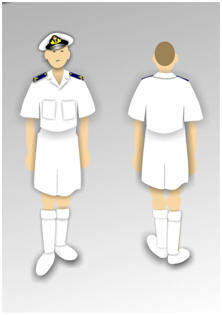 Rank insignia worn on the shoulder board. Gilt buttons often replaced with dark buttons. 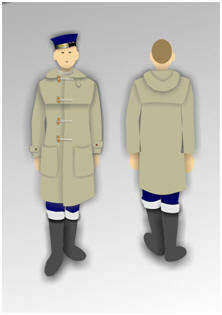 The jacket is similar in style to army battledress. 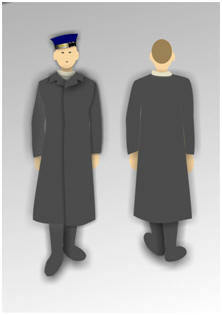 Note the jacket has three rows of buttons compared to the officer's jacket which has four. There are three buttons on the sleeve and one on each lapel. Sailors wore a wide variety of footwear with shorts. Gunthwaite figures of sailors in tropical uniforms have vague detailing on their feet deliberately so that figures can be painted with shoes, plimsolls or sandals. Working clothes could vary considerably in colour from dark blues to pale greys, or white. 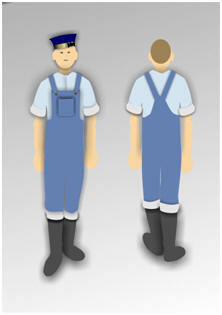 In a maritime environment, work clothing worn on a day to day basis is likely to fade. Give oilskin suits and coats a coat of semi-gloss varnish to replicate the material. 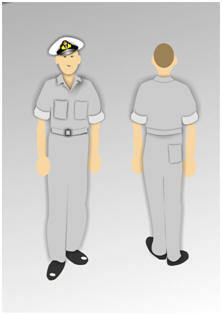 The special release of modern Australian sailors provides some challenges in painting disruptive pattern camouflage uniform. 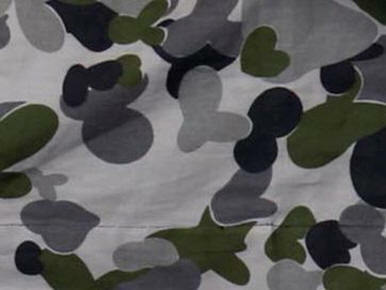 The Australian Camouflage pattern is distinctive and has been described as "jelly bean", "bunny ears", "hearts and bunnies" or "Ozcam". The Distruptive Pattern Naval Uniform (DPNU) is a 5 colour pattern using littoral (coastal) colours. My interpretation is that there are two shades of grey over a pale grey base with olive green and dark blue/grey patches. 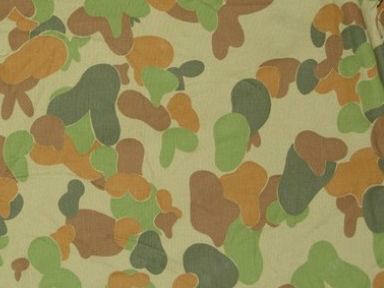 The Disruptive Pattern Camouflage Uniform (DPCU) is the same 5 colour pattern using pale sandy green as a base, two shades of tan/brown and two shades of green.